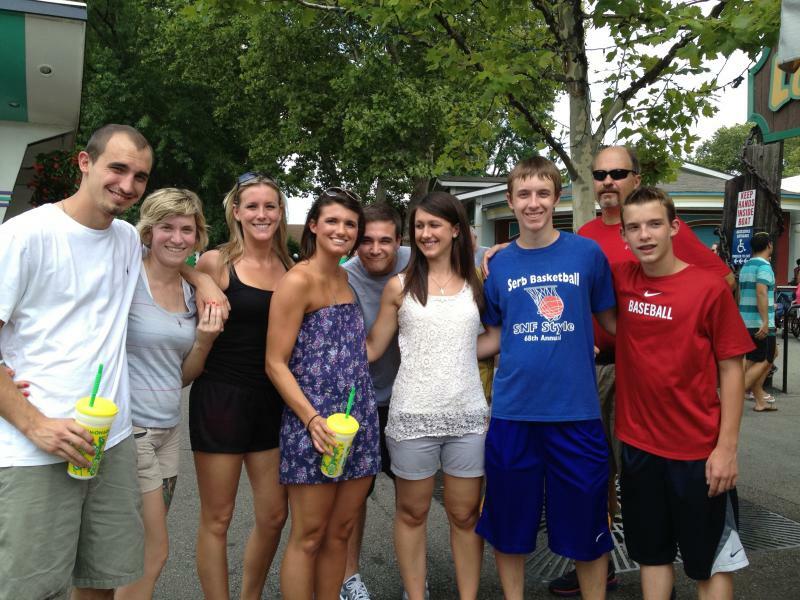 The Bajich cousins from Kansas City and Kentucky, along with Jocey Bizic of Texas with Cowboy Bob! 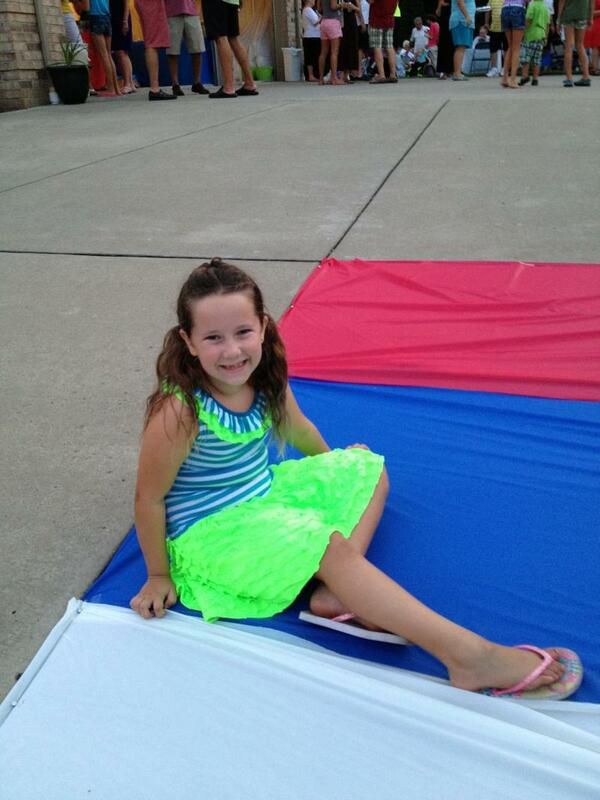 Joceyln Bizic, of Texas, on the Mistovich's SNF 4-Day Serbian Flag driveway, Thursday, July 18. 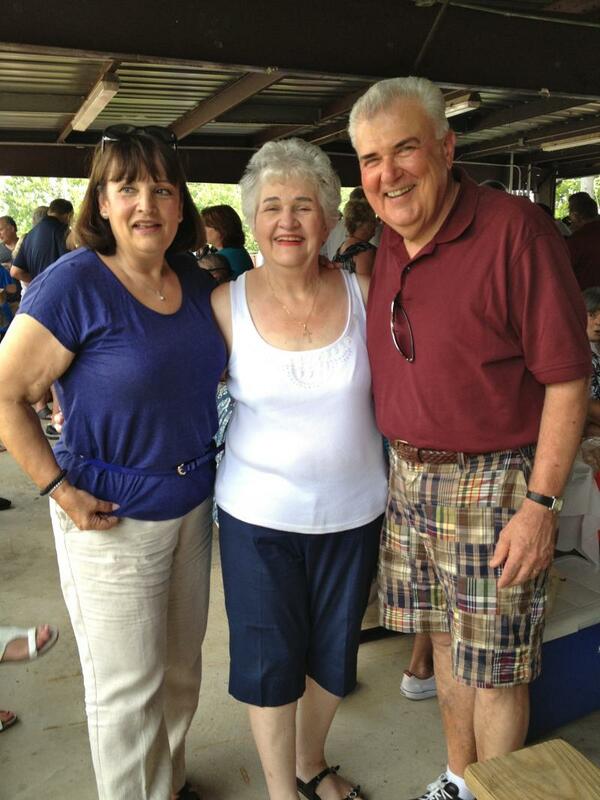 Sometimes we call it 4-Day, as George and Linda Mistovich get things started with their HUGE home party-picnic the day before, making sure the week-end starts out happy and the revelry lasts! 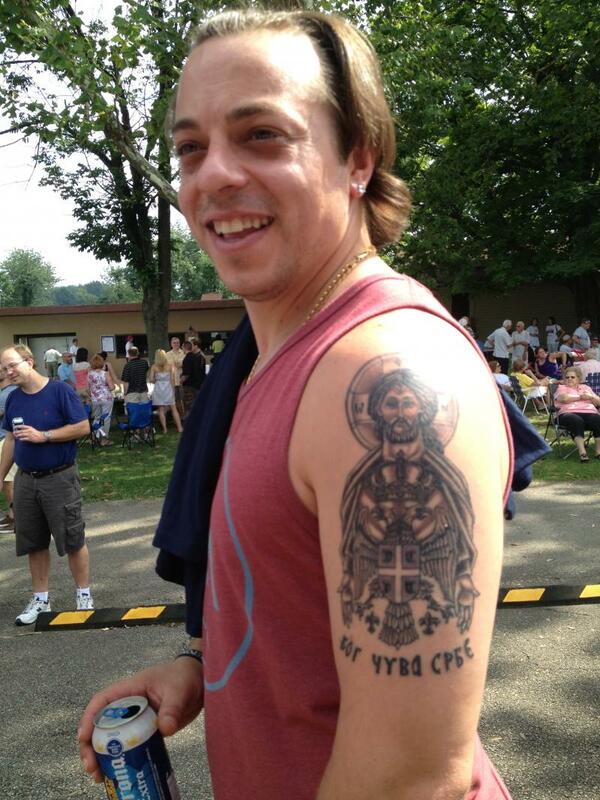 It DOES, until the last Serb out closes Kennywood, finishes kolo dancing on the Boat Ride, and partying at the 1,000+ person picnic at Castle Shannon's Holy Trinity St. Sava picnic/cemetery grounds. 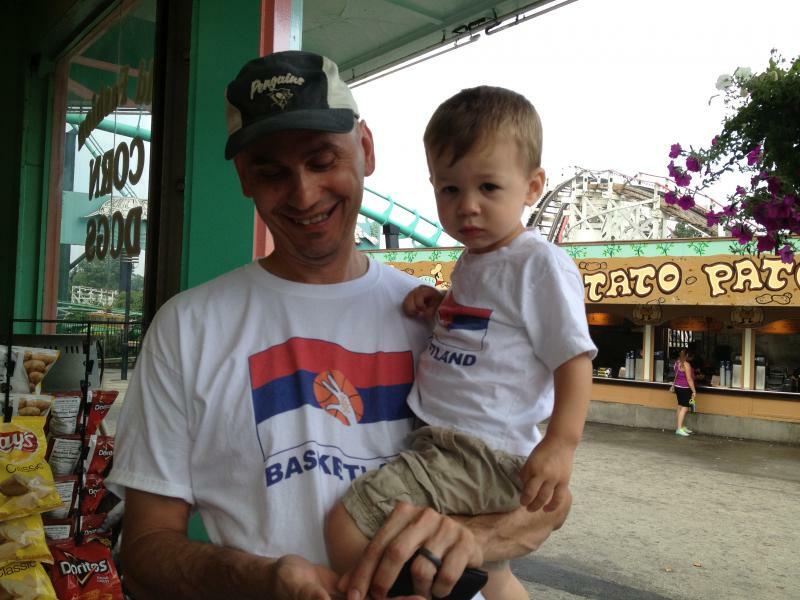 2013 SNF 3-Day began with the 97th Annual Serbian Day at Kennywood on Friday, July 19, 2013. 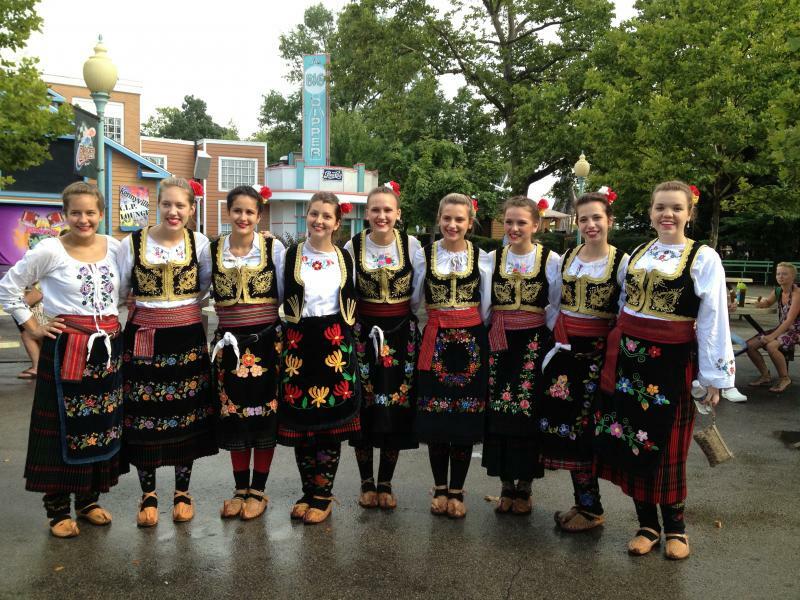 The Senior Group from St. Sava's Cathedral on Broadview Heights, Cleveland, OH, provided the entertainment on the Kennywood stage and did a tremendous job with their intricate Serbian kolo dance moves, like true professional dancers! Thank you, Cleveland! His Grace, Dr. Bishop Mitrophan, welcomed all with a spiritual blessing and gave thanks to the pioneers who kept this ethnic heritage alive and well for us for the past 97 years. 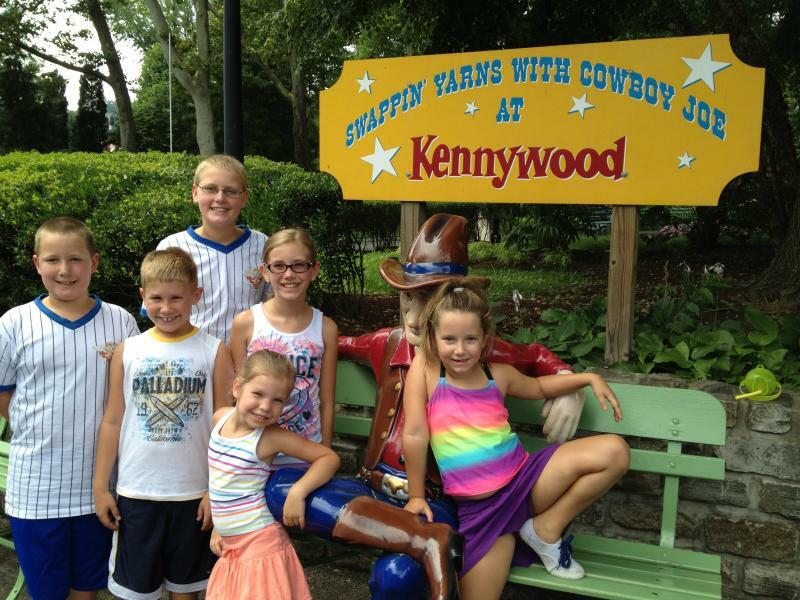 He BEGGED us to make sure we had 10 times the amount of people present for the next few years, when we will celebrate our 100th Kennywood Anniversary! George Klipa served as MC, while Bishop Mitrophan looks on approvingly. 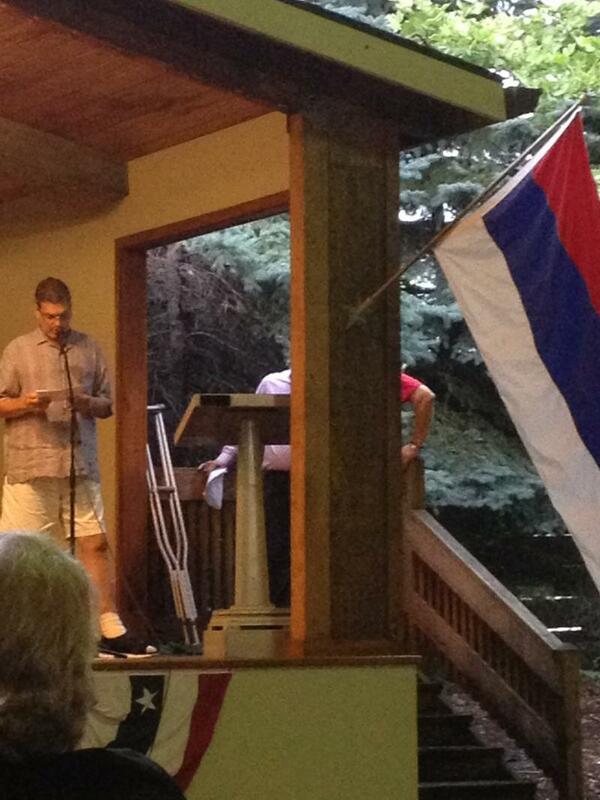 Both the American and Serbian flags were on display at Pavillion #5, Little Serbia. George Klipa was wonderful, as usual, in his role as "Domacin" or Master of Ceremonies, recalling all of the names of the people who worked so hard in the past, especially past SNF Presidents (Dushan Ljubenko, Robert Stone, George Martich, Peter Borkovich, Dan Pjevich, and now Mike Marjanovich.) 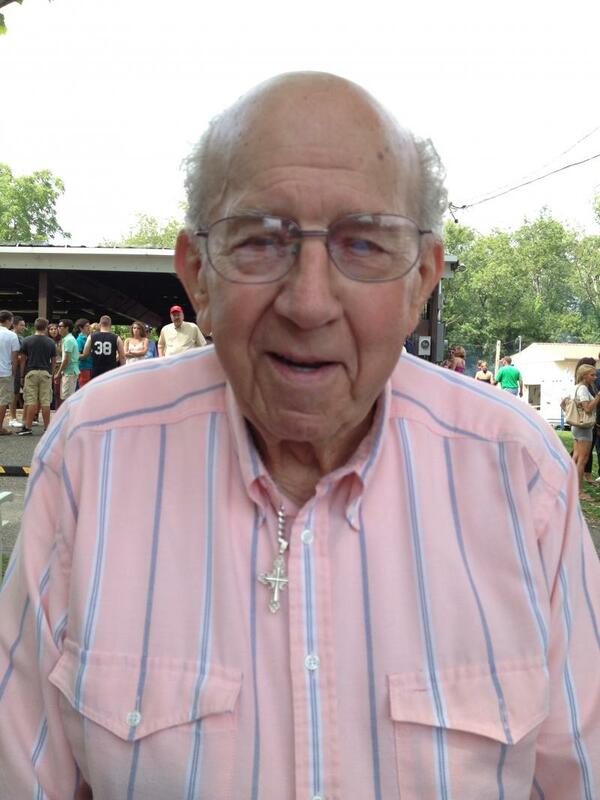 Too, you could almost "see" the performers he remembered from times past that graced the old Kennywood stage: "Vinka," the popular Svedalinka songstress, the famous "Popovich Brothers" from Chicago, "Edo Lubich," etc. George called Cissy Rebich to the stage as Director of the SNF. 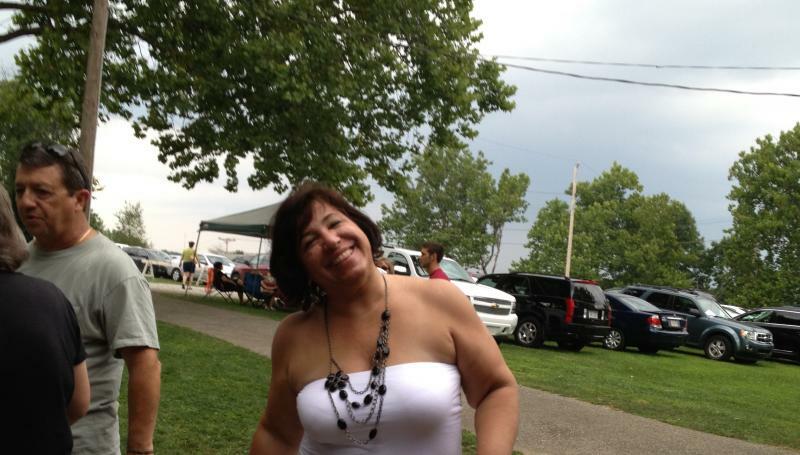 He lovingly calls her "Lastavica," like a swallow, who left the Pittsburgh area, but returned! Cissy also introduced her SNF office crew of Cheryl Leidig, Milos Rastavica, Susan Hayden, and all the SNF Board members in the audience. 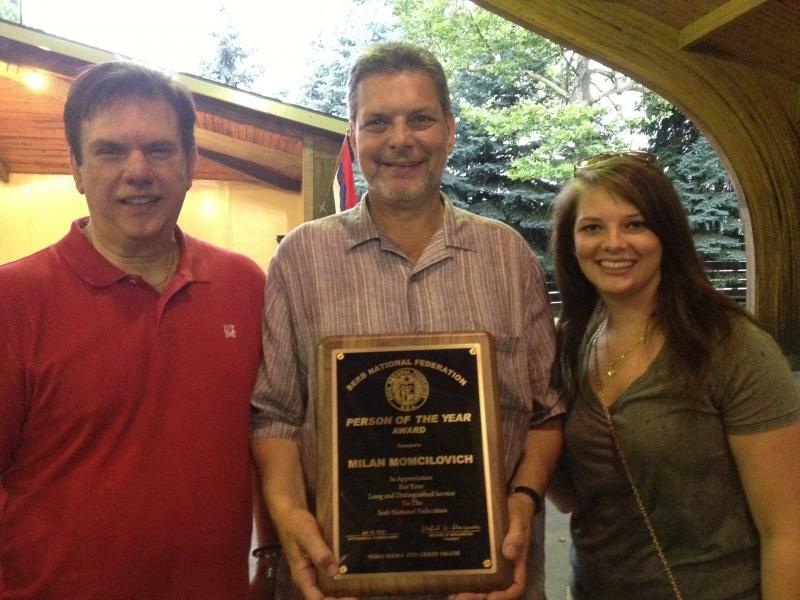 SNF President Mike Marjanovich, SNF "Person of the Year, 2013"-Milan Momchilovich, and his beautiful daughter, Morgan. Then it was SNF President Mike Marjanovich's turn to welcome the people in the audience, and to announce this year's SNF Person of the Year, Milan Momchilovich, President of Lodge #171 ("Djurdjevdanski Uranak"), of Schererville, Indiana. He is a lifelong member of the St. George Serbian Orthodox Church there, the son of parents Vidoje and Irena Momcilovich, and husband to Alice Rivich, with children Marc (26) and Morgan (22). He always participated in SNF athletic and cultural events as a child, and is now very active in making sure these wonderful traditions continue by continually being a top producer of the SNF and its benefits. He works tirelessly for his church, serving on the boards. He surely was worthy of this great honor! Nice to see Morgan accompany him too! 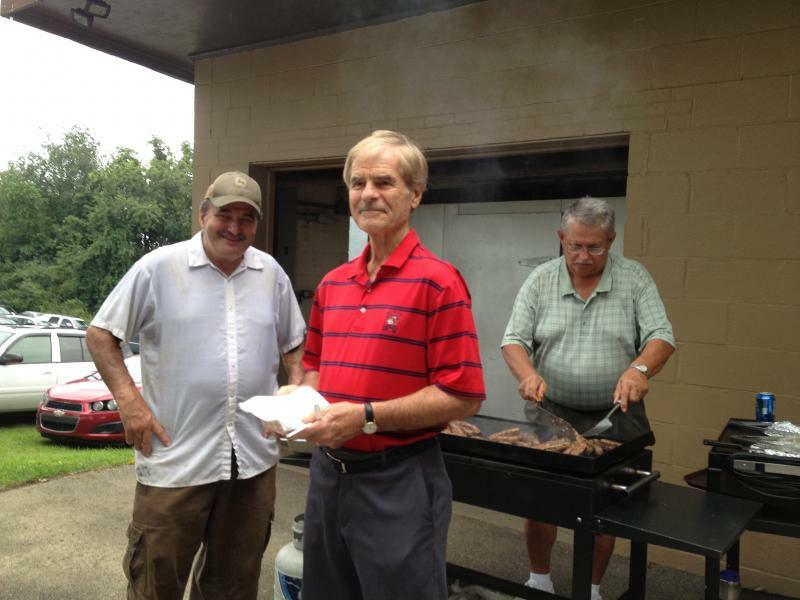 Milan has worked at Arcelor Mittal Steel for over 40 years as a CNC machinist, supervisor, programmer, and trainer. SNF Person of the Year Mike Momchilovich, giving his acceptance speech, urging more young people to sign their families up into the Savez, and at the end, he gave a nice donation to the SNF Scholarship Fund. 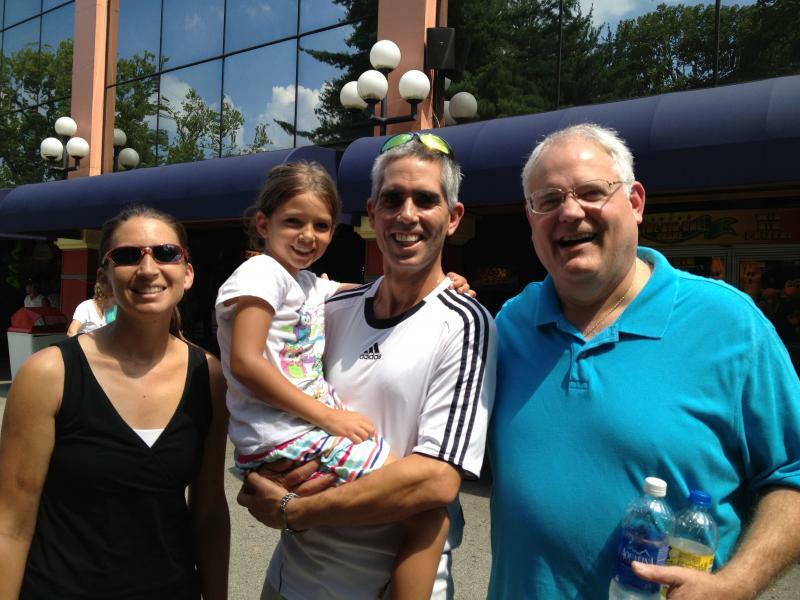 Strong families enjoying their day at Kennywood! 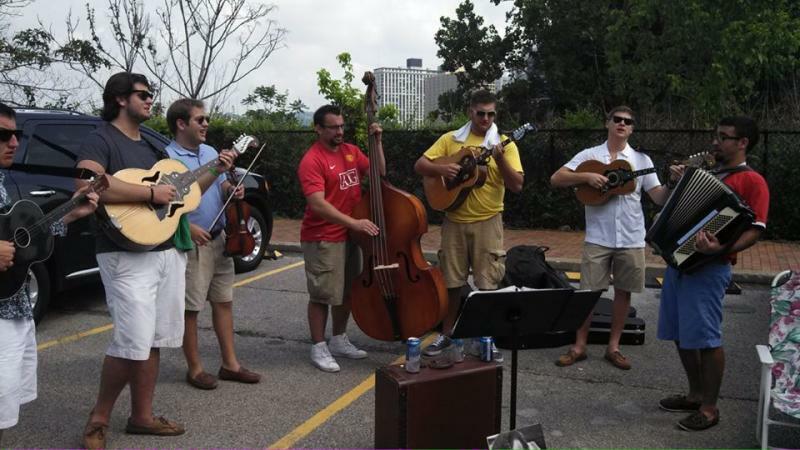 Bottom Photo: The Klaichs from Ambridge, Sewickley, Moon, PA and Houston, TX! The program is always at the large pavillion, number 5, so make sure you bring additional guests next year as we build to have more than 1,000 people again in the pavillion for our 100th Anniversary! Welcome to baby boy, QUINN LAWRENCE DeLUCA, born to parents Jana (Stipanovich) and Anthony DeLuca of St. Nicholas S.O.Church in Monroeville! Born Friday7/19/13, 8 lbs., 12 oz.! Yes, ANOTHER SNF member for sure! First grandchild of John and Sue Stipanovich! Let's hope for many more!!!! 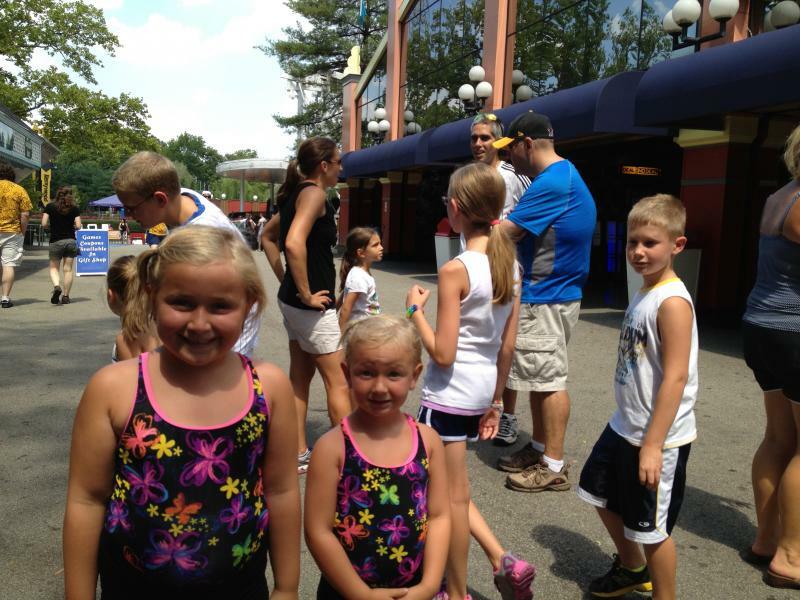 QUINN joins Sonja Capuzzi (21) and Marissa (Bobik) Trklja (3) as our special SNF Kennywood babies! Marissa Trklja, Michael Trklja, Jocey Bizic, and Nicholas Julius Trklja! 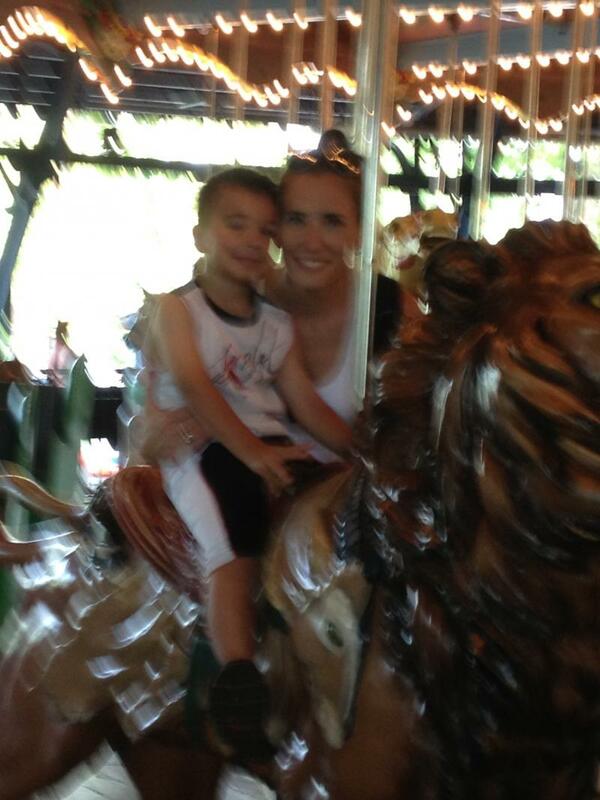 Marissa is our "Serbian Day at Kennywood" birthday girl, age 3 here! Thank you, Lackawanna guys and friends! TAILGATING AT THE MAJESTIC SHORE! 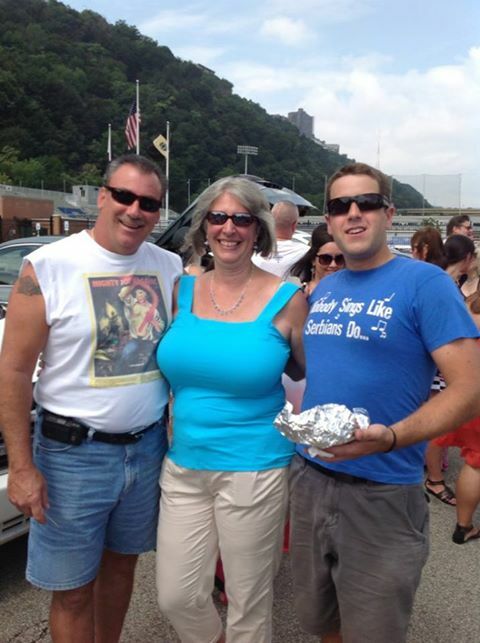 Saturday was the Boat Ride on the Majestic, the big boat in the Gateway Clipper Fleet. 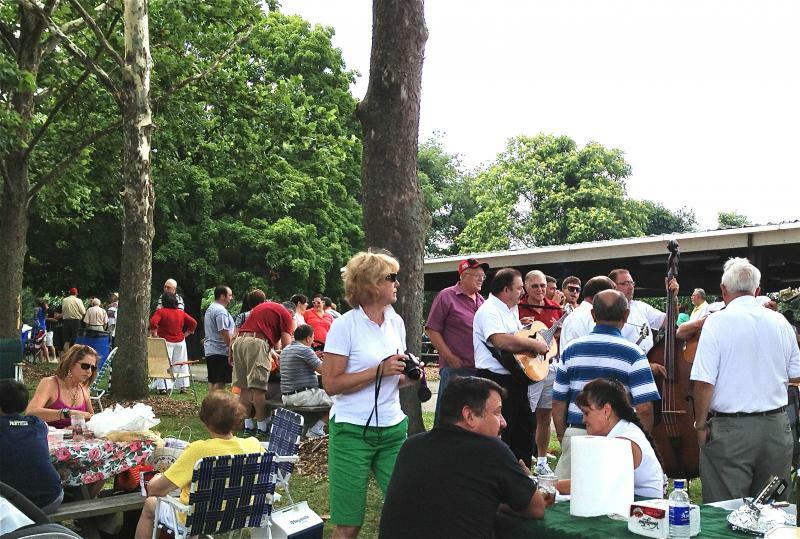 The TAILGATING is a wonderful addition, brought by the Aliquippa girls (Kathy Loverich, Cheryl Leydig, Eileen Mrkal, Elaine Zavada and Joanne Ridjanek). 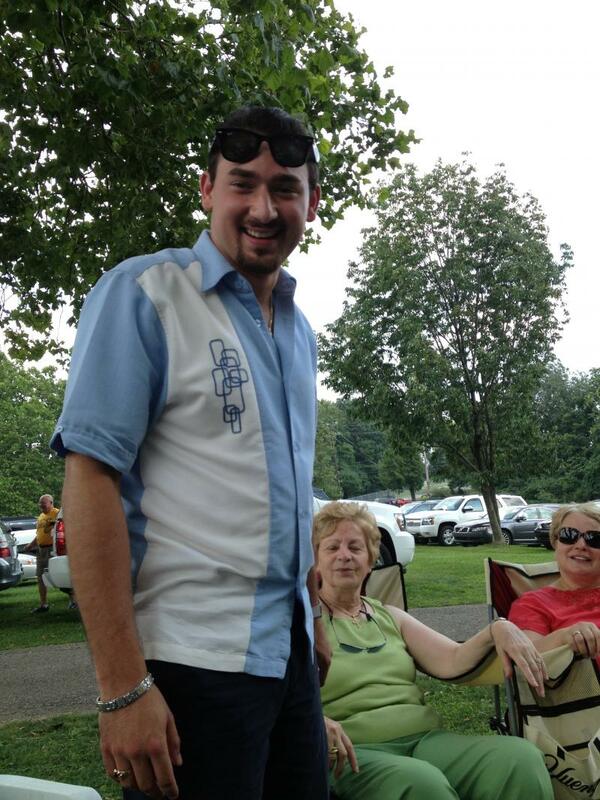 The Lackawanna, NY Serbs make it SO special for their Pittsburgh friends as they always provide the entertainment. (And the red/blue/white table flag too, always adds great interest!). They are GREAT orchestra players, but my favorite has to be of them singing Chuckie Popovich's, "Ali-quippa, I love stuffed cabbage, take me home, country roads!" 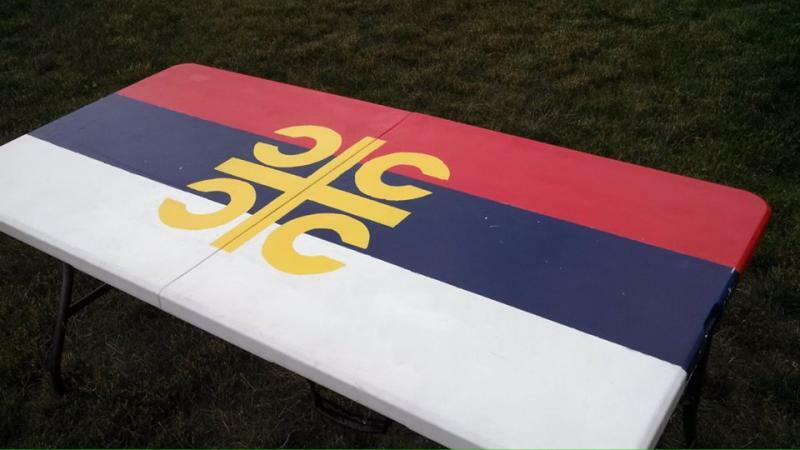 The famous Lackawann-Pittsburgh 3-Day table! These three believe "No one sings like the Serbs do!" On both Friday and Saturday nights, the American Serb Club was rocking with great bands... Sokoli and Osvezenje Bands played. Djuro Klipa's orchestra played at the picnic in the pavillion, and Radost in" the Dungeon!" 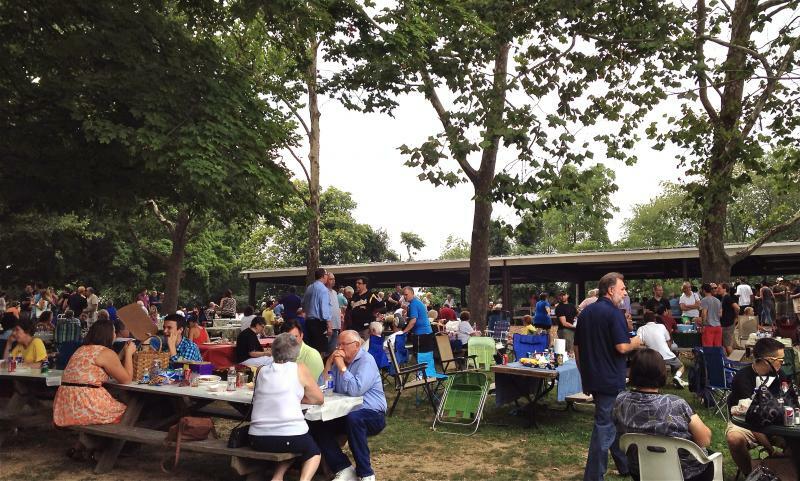 Sunday, July 21, 2013: Each SNF Sunday starts out with Church Services either at Holy Trinity Cathedral, or the local Serbian Orthodox Churches in the area (McKeesport, Monroeville, Steubenville, Carmichaels, Aliquippa, Hermitage, etc.) Then, its on to the Holy Trinity St. Sava cemetery grounds for a memorial service for Draza Mihailovich and all deceased SNF members. 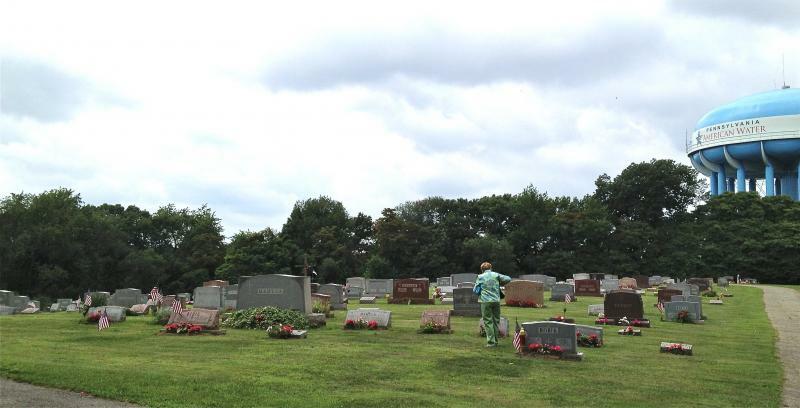 The cemetery is well-cared for. These are the pioneers who built our churches, and stuck together to help each other with Insurances, providing eternal resting places, etc. They showed great foresight! 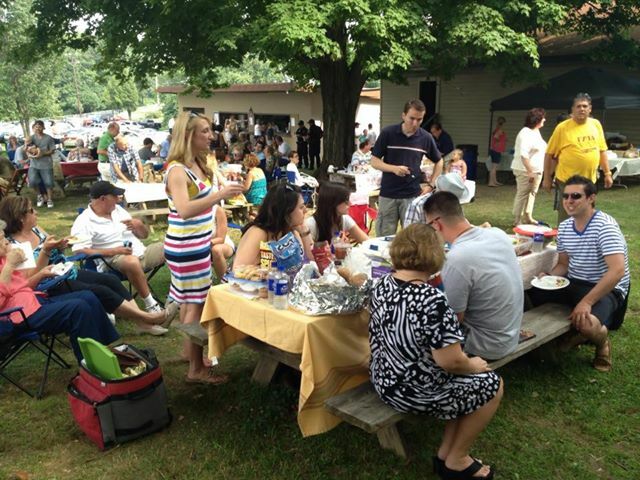 This year's picnic had to be one of the NICEST, friendliest, biggest picnics in a long time. First time in "the Dungeon" for little Danica Tomich, but we're sure it won't be her last! 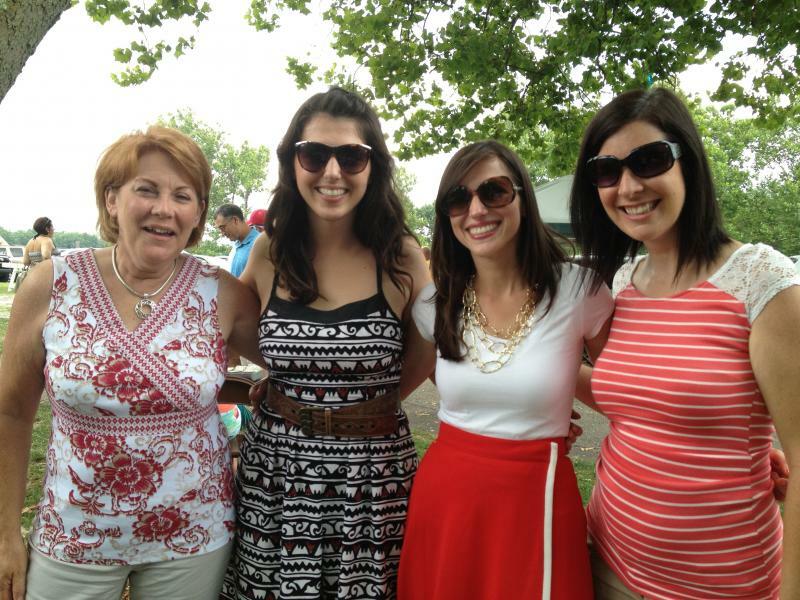 Not with these happy "Teti" and "Kuma"beauties surrounding her and her mother, Julie Tomich! 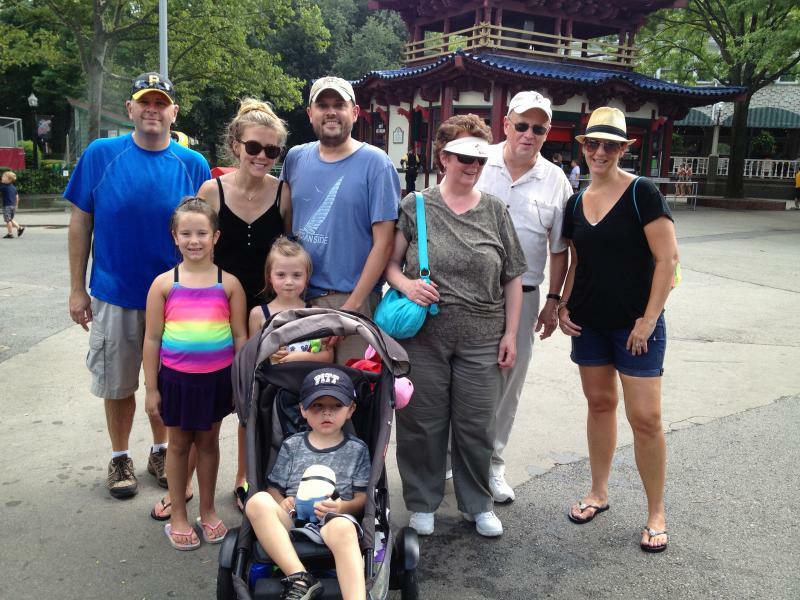 The Verlinich family of McKees Rocks! Their grandparents were STAUNCH SNF PIONEER supporters and the traditions continue! There are 2 Visnick beauties too! 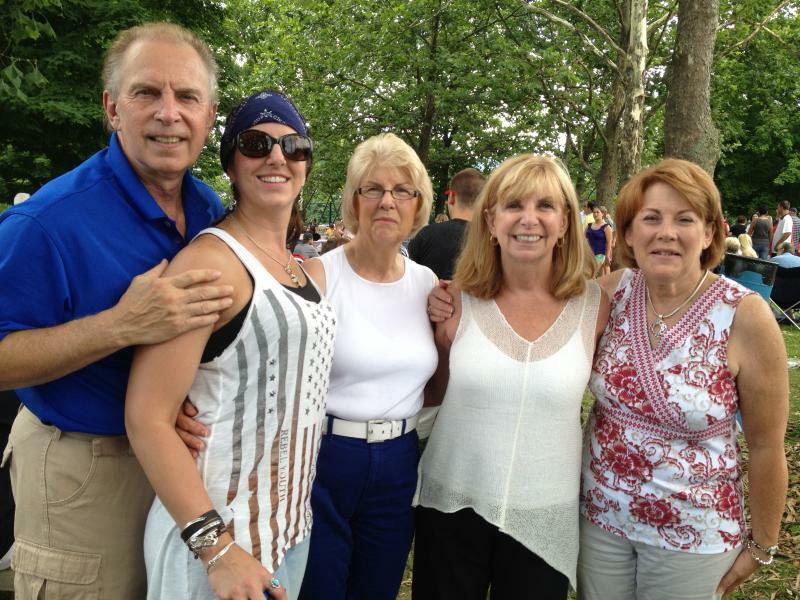 The Visnicks (Joyce and Milan from Washington, DC, and Romilda Lovensky from California! 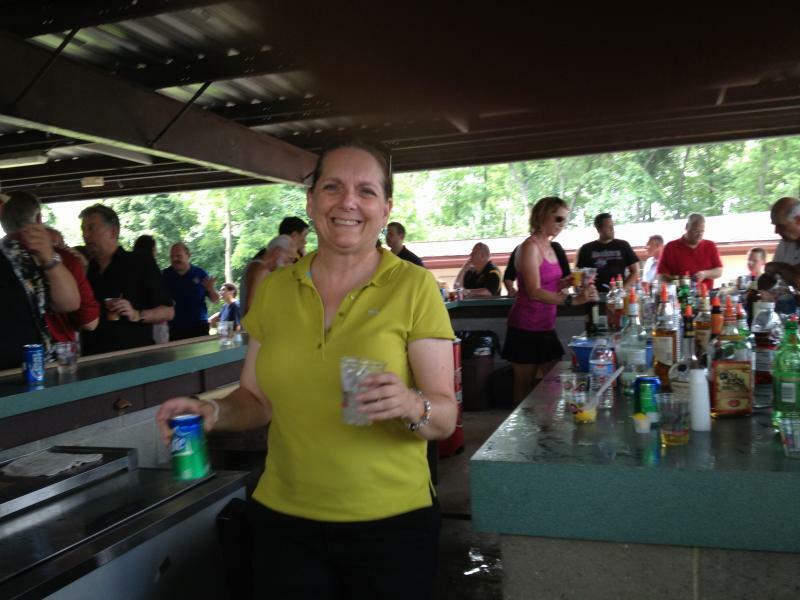 Romilda is the wife of SNF longtime Board Member, John Lovrensky, who flies in to Pittsburgh quite often. We're all grateful! Brnilovich-Karlo Family. Every year, same spot! 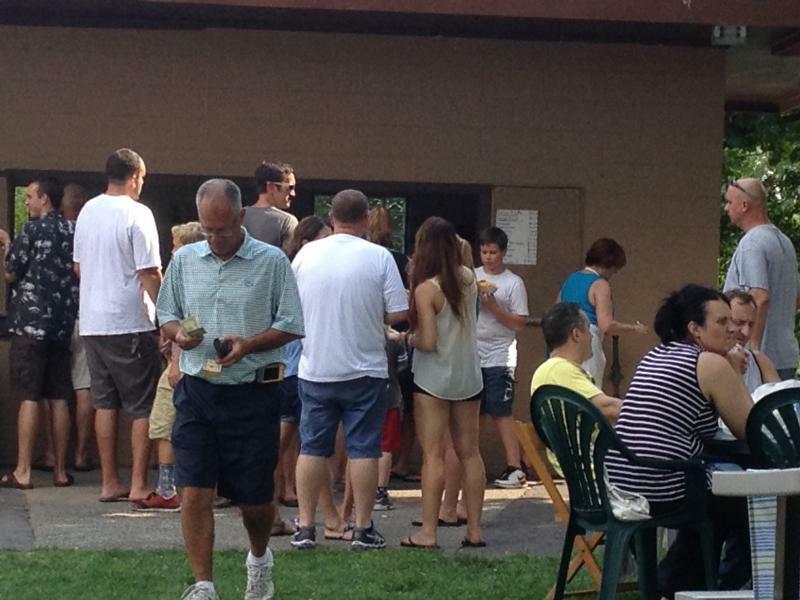 The Danny Kukich-Capuzzi Families share a feast! 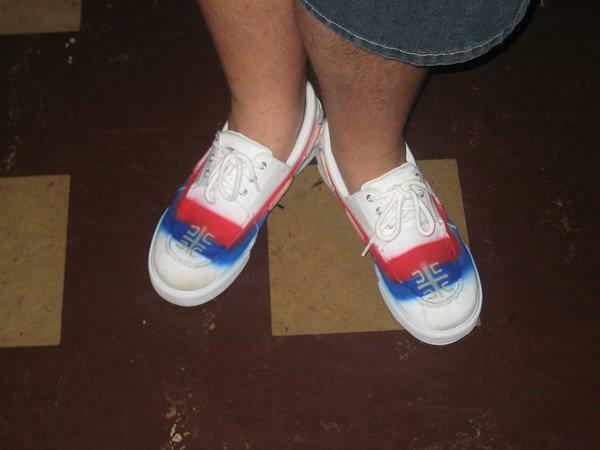 Julie Tomich shared this photo of brilliant Grant Mrvos' SNF 3-Day Shoes! He should market these! One of the most unique things this year was the exciting time finding out Baby Benusa's gender. Boy or Girl? 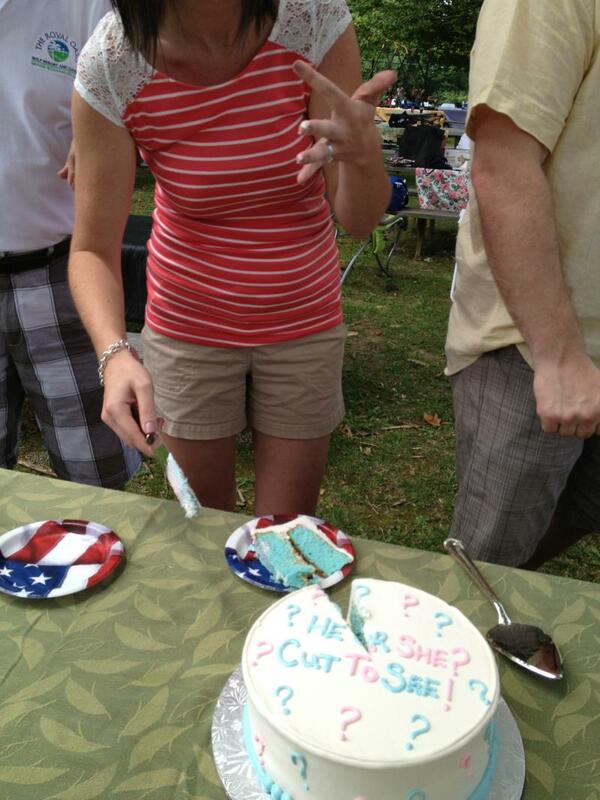 A "HE" or a "SHE" coming in December? 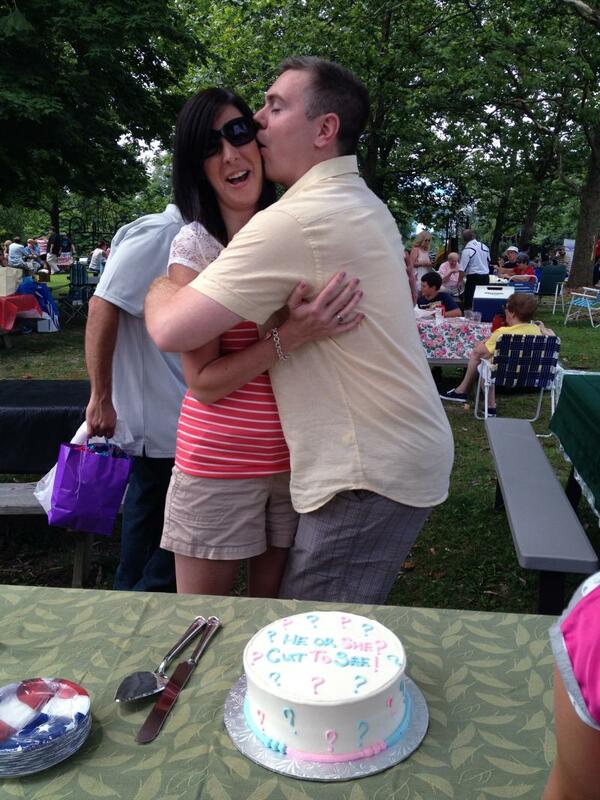 The cake told the tale when Halle (Belosh) and Matt Benusa cut the cake and found the cake batter was BLUE! We're sure little Nikola Fisher Benusa will be an SNF member as soon as he's born! His great-grandmother, +Martha Mamula Belosh, was SNF "Woman of the Year" in 1988. Grandparents Paul and Kathy Belosh can hardly wait! 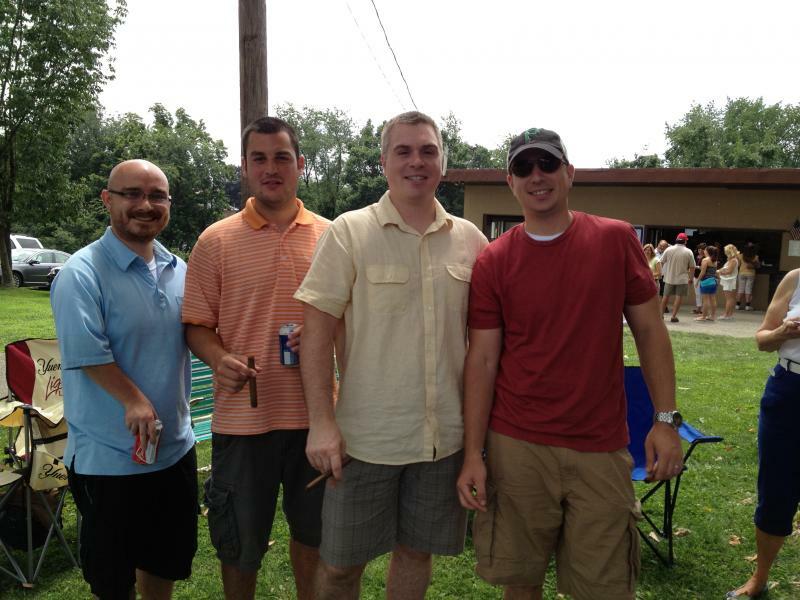 Happy "Campers" with their cigars of joy! The joy of generations being together for 3-Day cannot be expressed enough in words or photos. It has to be FELT in the heart! 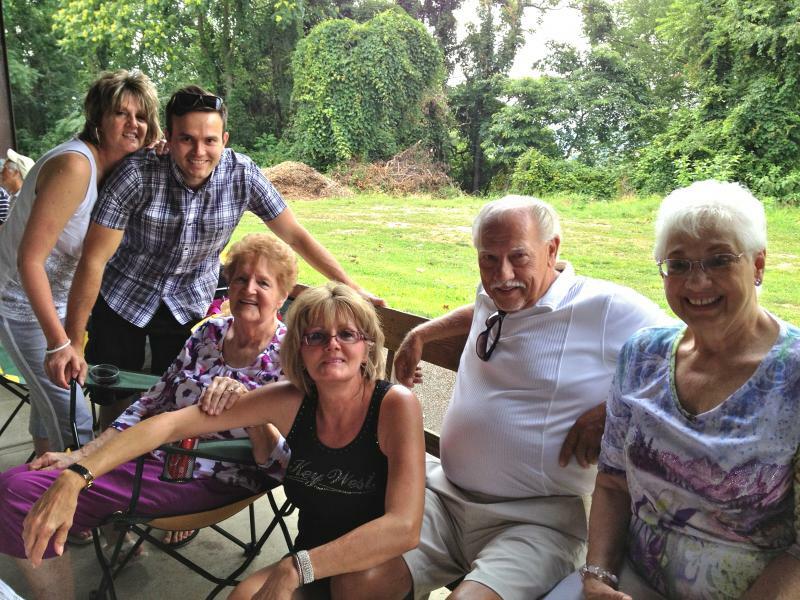 It makes THIS grandmother's heart do FLIP-FLOPS! To view ANY of these photos in a larger size, just click on the bottom right-hand corner! Enjoy! Ziveli! with credit to Clement Moore's "Night Before Christmas"
Dane wrote: "Here is the final version of 'Twas the night before 3 Day.' Non-rhyming comments are no longer subject to ridicule. If you missed the story, this started with one simple verse followed by comments from fellow poets Mira Andrich, Mel Bard, Bob Topich, Jovo Nada Potkonjak, Sandi Radoja, JT Kordesich, Roger, Von Trbovich Orlich, Lexy Vudrag and Mim Bizic. well done friends!" "Donesi mi pivo and make sure it's cold!" what's better than 3days?...well how about four! Nada wishes she were there - but no need to fear. This year it's Greece and 3-Day next year!!! why everyone kolos...that's all that does matter. the fountain at The Point that is my dear. it's summer so that is the weather we're getting. lamb right afterwards and kolos real soon! our Greek friends joined in, it's Nikki and Nick! and we whistled and shouted and called them by name! On Mira, on Ljubi, on Ruza i Kato." Just like her mother, that’s what she does for the Serb National Federation. and then we agreed "These are the best celebrations! to hear Dane Topich say, "I LOVE THREE DAY"
now kolo kids, kolo kids, kolo kids all. with a trunk full of pecanja and a few other things, too! of course Djuro Klipa laying more kolos down! I spy Andrija Bajic who came into town! and with brother Toma sang everything he knows. when he pulled it out playing he had it just right. look it's Randy and Bobby and Fouch on the drum! with all the crowd singing it left everyone hoarse. but we call it "Three Day" since we're set in our ways. and we can hardly stand waiting as it draws so near. ‘twas said by the boy who started this time. We'll raise a glass, Roger, and call on your cell phone! for the big crowd on Sunday that's sure to be there. to show all of Serbdom how well we can rhyme. just chillin' in the AC waiting for her gibanica. Saying "IF you are not a member of the SNF, come see me!" Monday morning arrives and we open our eyes, “Novi dan je! Necu nikad piti vise…ni manje! Three Day comes only once every year. Only to remember we'll do it again at golf in two weeks. 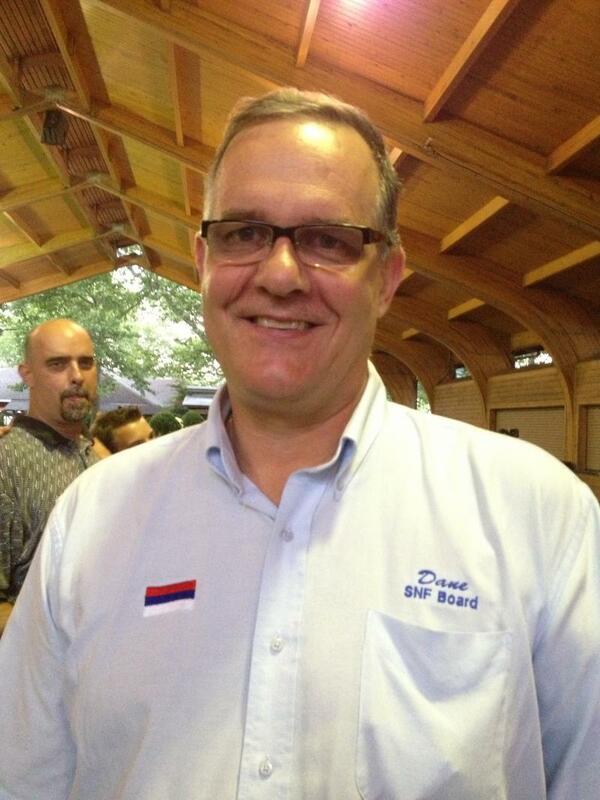 "Happy 3-Day to all… and to all… ZIVELI !!!" I don't usually like tatoos, but I loved this one! Can't think SNF (or basketball) without thinking of the Medichs! Our Bobik-Grese Girls, Alayna and Alexis Jo. 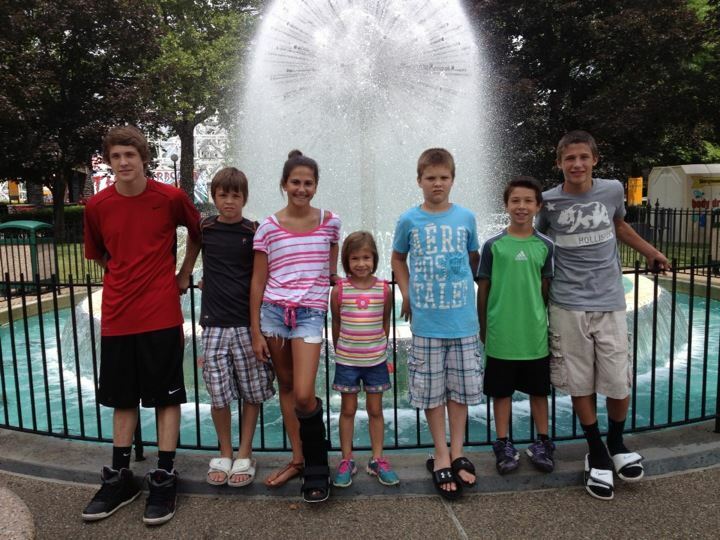 Their mother Michelle and Dad Blaise, met while working in Kennywood! 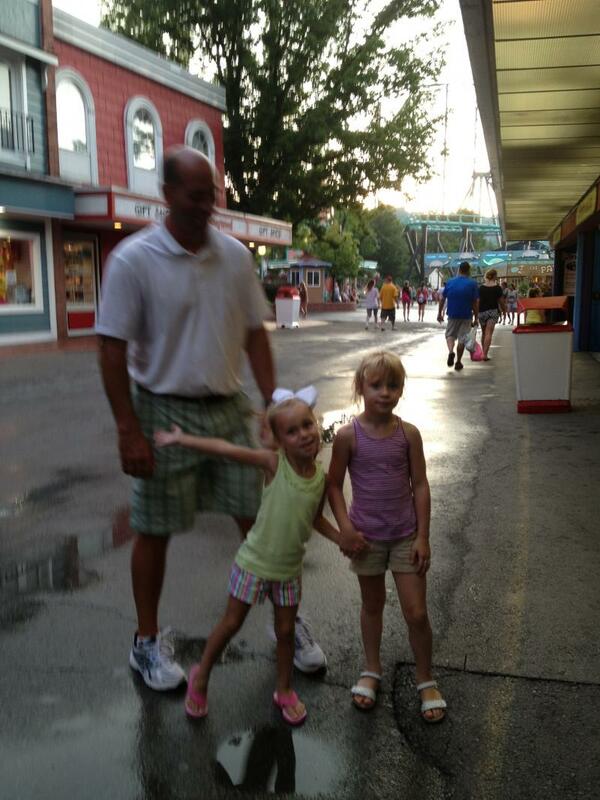 Mike and the Milanovich girls! Sophie Kovachevich Samardgia and Son from Canada now, but we claim her as "Ours," an Ambridge-Aliquippa St. Elijah beauty! The Stepanovs were there too! 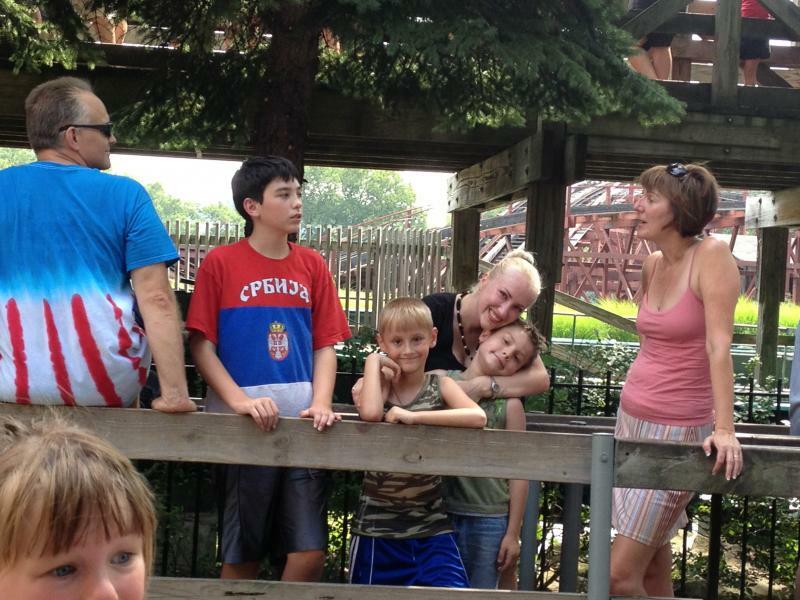 Alexander, Roman and Demetri kept their Moms busy while waiting for the LOG JAMMER water ride! Our Alex Brnilovich is engaged! Thanks Tiho! The LAMB was absolutely SUPERB this year! Ray agrees and Mike's there in the back making CEVAPS! Working just as hard as her great +mother, Bunny Belich, did! 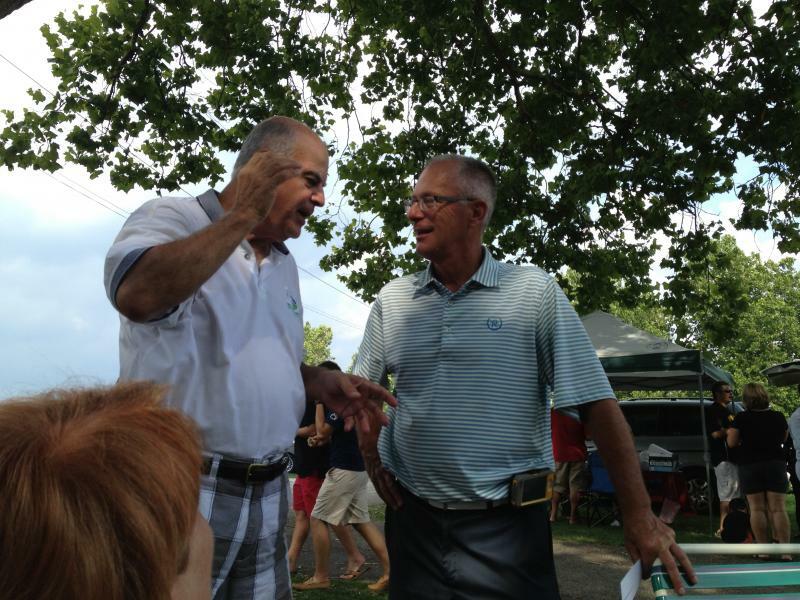 Paul and Larry discuss yesterday's GOLF game! 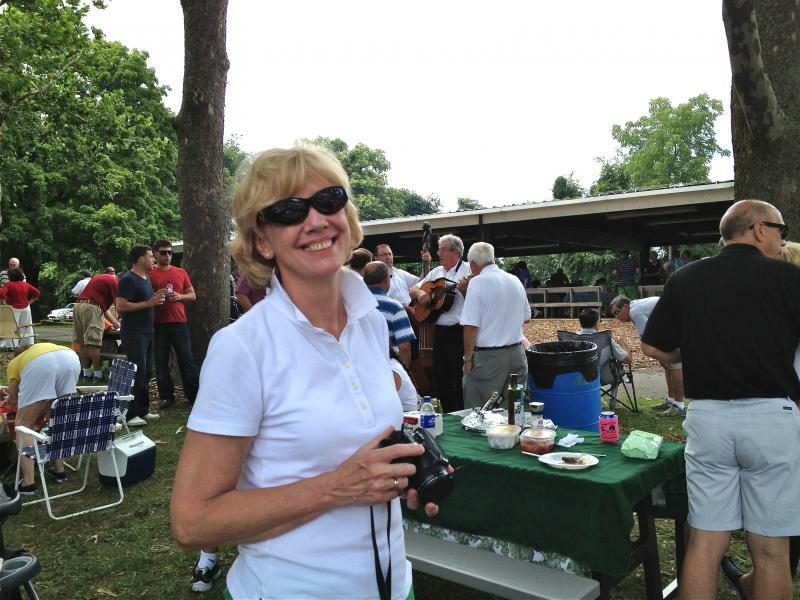 Our Debbie Backo listens to Radost Orchestra entertaining the crowd. John Kasich is in the foreground. He is a great historian for Farrell-Hermitage in SNF affairs! Here's a better one of Debbie! Seeing happy Tamara always reminds me of the good times with her mother, Millicent! 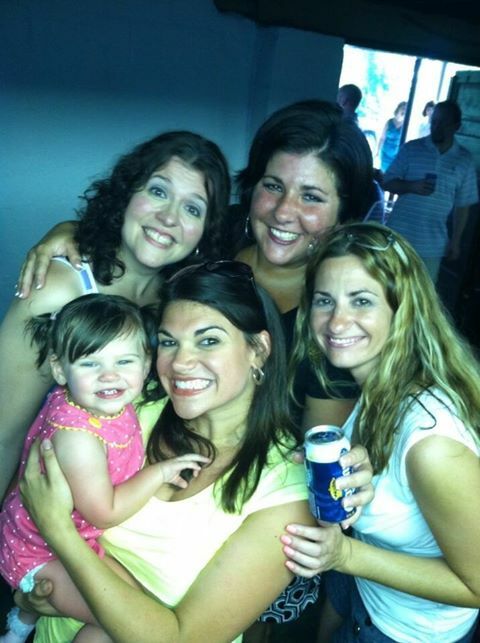 Kathy, Sladjana, Natasa & Halle! 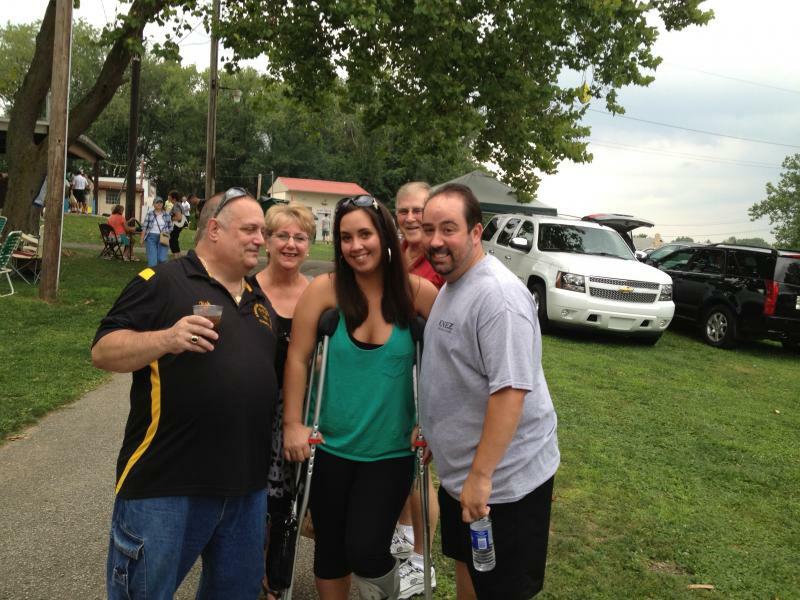 Cera on crutches in the middle, surrounded by Uncle Tom Trkula, Aunt Kathy Loverich, cousin Adam, and Robby Stone! 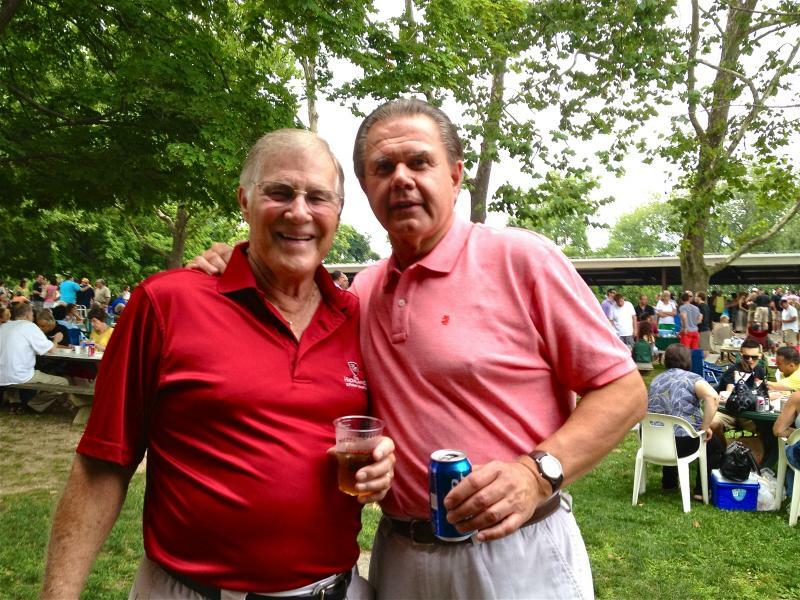 Thanks to Ron and Rella Cvetican of WV for always making the Boat Ride raffle so much fun! 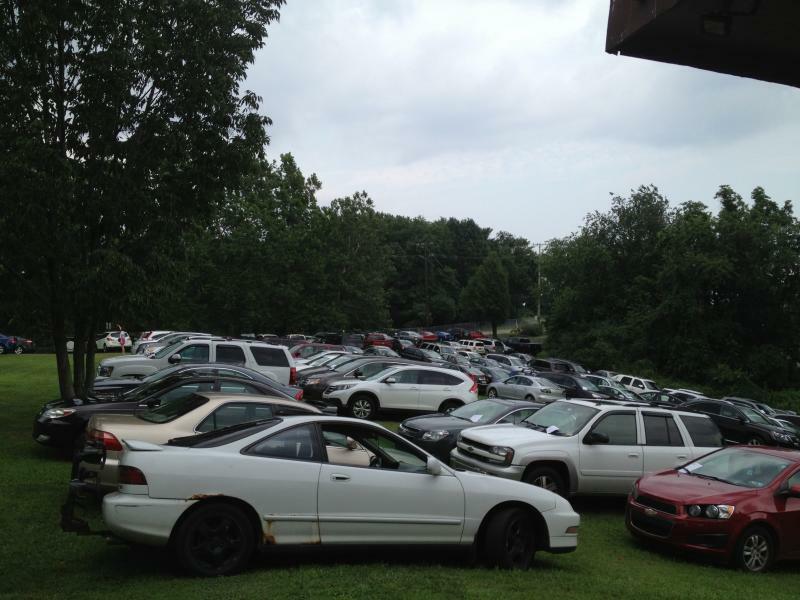 Look at the parking lot! All the "grass" was taken, front, side and way in the back! 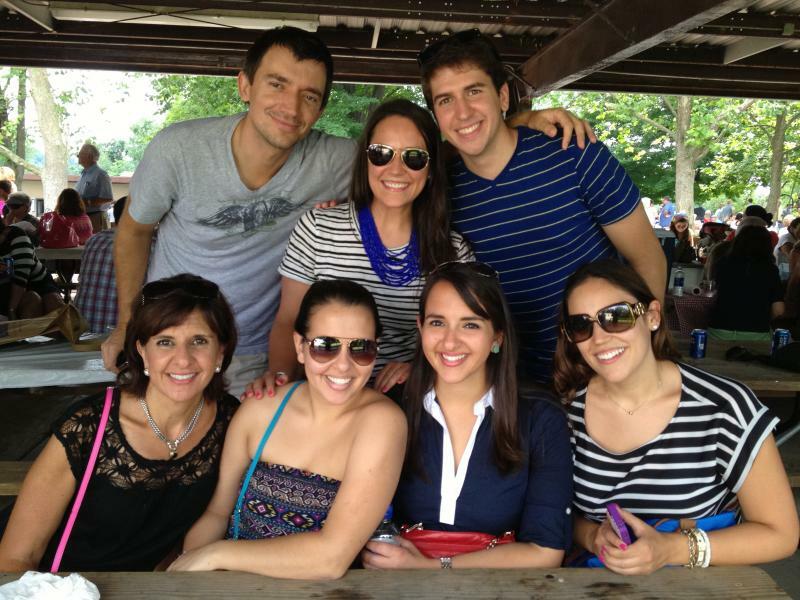 Great picnic! The "Kitchen" did brisk business! We'll end with this magnificent photo by Milana Capuzzi, of the Serbian flag taken in front of Steve and Natasa Capuzzi's house! A great big "Thank You!" 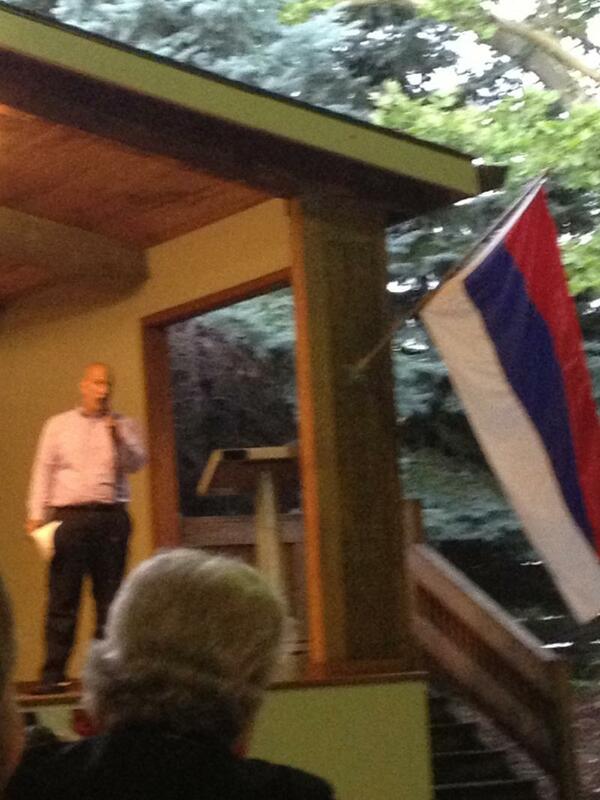 to KDKA's Jim Graci for having news about our 97th Annual Serbian Day at Kennywood announced on the radio. He made a lot of people so happy!